Astro-imaging has grown enormously in popularity in the last decade thanks to the ready availability of an impressive variety of affordable CCD cameras and Digital SLRs, as well as excellent image processing software. Accordingly, there is now a wealth of literature, both in the form of published books and articles available online, to suit the needs of advanced amateurs and novice imagers alike. So I found myself asking the question; “Is there really a need for yet another book on the subject of astrophotography?” To my great surprise I think the answer is an unreserved ‘yes’. Ruben Kier, a highly accomplished astophotographer, has compiled an impressive list of 100 objects, arranged in order of when they are best placed for observers in the northern hemisphere. Dispensing with the usual formula of talking the reader though the technical mine field that is CCD imaging, Kier presents his chosen objects – well-visited galaxies, star clusters and nebulae of all kinds – in glorious Technicolour, together with a brief, but accurate description of the nature of the object, as well as how the image was taken and processed. Though the book is clearly aimed at the established imager, the last three chapters (section 2) is dedicated to introducing new comers to the hobby. Rest assured, all the favourites are covered by Kier and are equally divided up into targets that are best imaged by telephoto lenses, small, medium and large aperture ‘scopes. I was particularly impressed at how well some deep sky objects can now be imaged even with the full moon in the sky. 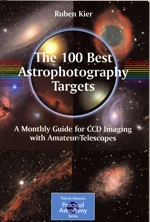 The book will serve as an inspiration to those wishing to take their CCD imaging to the next level. This 132-page special edition features the ultimate observing guide for 2009, a review of all the biggest news stories of 2008, in depth articles covering all aspects of astronomy and space missions for 2009, previews of International Year of Astronomy events and much, much more.